The etiologic agent of inhalational anthrax, Bacillus anthracis, produces virulence toxins that are important in the disease pathogenesis. Current studies suggest that mouse and human macrophages are susceptible to immunosuppressive effects of one of the virulence toxins, lethal toxin (LT). Thus a paradigm has emerged that holds that the alveolar macrophage (AM) does not play a significant role in the innate immune response to B. anthracis or defend against the pathogen as it is disabled by LT. This is inconsistent with animal models and autopsy studies that show minimal disease at the alveolar surface. We examined whether AM are immunosuppressed by LT. We found that human AM were relatively resistant to LT-mediated innate immune cytokine suppression, MEK cleavage, and induction of apoptosis as compared with mouse RAW 264.7 macrophages. Mouse AM and murine bone marrow-derived macrophages were also relatively resistant to LT-mediated apoptosis despite intermediate sensitivity to MEK cleavage. The binding component of LT, protective Ag, does not attach to human AM, although it did bind to mouse AM, murine bone marrow-derived macrophages, and RAW 264.7 macrophages. Human AM do not produce significant amounts of the protective Ag receptor anthrax toxin receptor 1 (TEM8/ANTXR1) and anthrax toxin receptor 2 (CMG2/ANTXR2). Thus, mature and differentiated AM are relatively resistant to the effects of LT as compared with mouse RAW 264.7 macrophages. AM resistance to LT may enhance clearance of the pathogen from the alveolar surface and explain why this surface is relatively free of B. anthracis in animal models and autopsy studies. Anthrax, a virulent and zoonotic disease recognized since early human history, is caused by a Gram-positive, aerobic, spore-forming, rod-shaped bacterium, Bacillus anthracis. Three primary forms of the disease are due to three different mechanisms of exposure: ingestion (gastrointestinal), contact (cutaneous), or inhalation (inhalational) (1). Although all forms of disease can lead to fatal system infection, inhalation is considered to be the most life-threatening pathway and was the most lethal primary form identified during the recent bioterrorism attack in 2001 and during the accidental exposure in the manufacturing process in Sverdlosk in 1979 (1, 2). This disease occurs after inhalation of spores between 1 and 5 microns. This size is optimal for delivery of the pathogen to the alveolar space, which is the site of entry of the pathogen (3). Inhalational anthrax is characterized by a rather unique finding in that the inhaled spores do not vegetate and cause disease at the site of entry (4, 5, 6, 7). That is, pneumonia is not a typical feature of inhalational anthrax. Instead, spores are rapidly and efficiently phagocytosed by alveolar macrophages (AM)3 and dendritic cells (DC) (5, 8, 9), and subsequently carried through lung tissue and lymph ducts to the regional thoracic lymph nodes. It is from the lymph nodes that dissemination occurs. B. anthracis produces two binary toxins and a capsule that appear to play some role in the pathogenesis of inhalational anthrax. It contains plasmid pX01 that encodes the three toxin components: an 83-kDa lethal factor (LF), an 89-kDa edema factor (EF), and an 85-kDa protective Ag (PA). A second plasmid, pX02, encodes genes involved in synthesis of a poly-d-glutamyl capsule. Deletion of either plasmid attenuates virulence (10). LF and EF each separately form a binary toxin with PA such that two different binary toxins are formed: lethal toxin (LT), consisting of PA plus LF, and edema toxin (ET), consisting of PA plus EF (11). The binary forms of the toxins are so named because of their biological effects in animal models. Intradermal injection of ET (PA+EF) induces edema, whereas injection of high concentrations of LT (PA+LF) causes severe hypotension and death (12). There is evidence that B. anthracis toxins play a role in the pathogenesis of inhalational anthrax, but the exact role has been debated. In mice, at high exposure to spores intratracheally, specific mutations of the LF, EF, or PA genes did not appear to have a large effect on the LD50 or mean time to death (13). This work argues against toxins acting locally to facilitate the development of disease in animals exposed to B. anthracis. However, mAbs to PA reduce dissemination from the lung by B. anthracis in rabbits, and it has long been known that vaccination with PA is protective (14, 15, 16). B. anthracis LT has been shown to induce apoptosis in certain mouse macrophages through cleavage of MEK kinases (17). These cells, as well as human AM have also been demonstrated to express mRNA for the known anthrax toxin receptor (ATR)1 (TEM8 \ ANTXR1) and ATR2 (CMG2 \ ANTXR2) (18). These findings, as well as the experiments in rabbits, have led to the development of a paradigm that concludes that LT facilitates dissemination of B. anthracis through LT-mediated immunosuppression of the AM. Inhibition of the main resident phagocyte of the lung, the AM, by B. anthracis toxins would seem to be in conflict with findings on human autopsy specimens that the alveolar space is cleared of the pathogen. This conflict also occurs in animal models of inhalational anthrax (4, 5, 6, 7). We have previously shown that human AM rapidly and efficiently phagocytose B. anthracis spores. Spore exposure also induces production of several cytokines and chemokines through activation of MAPK signaling pathways (19). These results clearly showed that human AM have a robust innate immune response to B. anthracis. This result led us to hypothesize that in contrast to the previous studies, human AM may play an active role in protection of the host against the pathogen. In this study, we compared the immunosuppressive effect of B. anthracis LT on human AM, mouse AM, murine bone marrow-derived macrophages (BMDM), and mouse RAW 264.7 macrophages. We found that human AM, unlike mouse RAW 264.7 macrophages, are resistant to MEK cleavage induced by LT. Human AM were also less sensitive to LT-mediated suppression of the innate immune cytokine response to spores than mouse RAW 264.7 macrophages. Human and mouse AM and murine BMDM were resistant to the proapoptotic effects of LT as compared with RAW 264.7 macrophages. We found that binding of PA, the binding partner of LF and EF, was minimal in human AM, as was expression of the two known receptors of PA, TEM8 \ ANTXR1 and CMG2 \ ANTXR2. These effects occurred even though mRNA for both receptors was expressed in human AM. The findings demonstrate that mature macrophages are resistant to the immunosuppressive effects of the anthrax toxin LT. The results suggest that, rather than a target for the virulence toxins and susceptible to their effects, AM are, in fact, resistant to the toxins and are likely an obstacle that must be overcome by the pathogen to establish disease in the host. The findings may explain why normal, nonedematous, alveolar surfaces are free of the pathogen because AM are still able to respond vigorously to B. anthracis as they are resistant to its exotoxins. RAW 264.7 mouse macrophage cells and B. anthracis Sterne strain 7702 (pX01+ pX02−) were provided by J. Ballard (University of Oklahoma Health Sciences Center, Oklahoma City, OK). RAW cells were cultured in complete medium, RPMI 1640 with l-glutamine (Sigma-Aldrich), 10% FBS (Mediatech), 1% penicillin-streptomycin solution (Mediatech). LF, PA63, and PA63-FITC were purchased from List Biological Laboratories. Abs were purchased from the following: anti-TEM8 \ ANTXR1 IgG (Abcam); anti-rabbit IgG (GeneTex or Cell Signaling Technology); anti-CMG2 \ ANTXR2 (human and mouse) IgG (R&D Systems); anti-goat IgG (R&D Systems); anti-CD11b (Abcam); anti-MEK-1 (Chemicon International); anti-MEK-2 (Santa Cruz Biotechnology); anti-MEK-4 (Santa Cruz Biotechnology); anti-MEK-6 (BioLegend); anti-MEK-7 (Life Span Biosciences). For spore preparation, bacteria were grown overnight at 37°C with continuous shaking in LB medium and were then streaked onto Arret and Kirchbaum agar sporulating slants. Bacteria were incubated for 3 wk at 30°C. The slants were washed with 10 ml of chilled, sterile, deionized water, spun at 10,000 × g for 10 min; and resuspended in 10 ml of chilled water. The spore suspension was heated at 65°C for 30 min to kill vegetative bacteria. After heat treatment, the spores were centrifuged for 10 min at 10,000 × g. The pellet was washed five times to remove contaminating cell debris. The supernatant and the very top layer of the pellet were aspirated and discarded each time, and the spores were then resuspended in chilled sterile deionized water and centrifuged for 10 min. The titer of the spore preparation was determined by plate counts. The spores were diluted to 1 × 109 spores/ml and stored at 4°C. Titers were reconfirmed by plate counts before each use. There was no detectable endotoxin in the final spore dilutions used in the experiments as determined by a Limulus amebocyte lysate assay (Cambrex). Human macrophages were obtained by bronchoscopy with the signed informed consent of human subjects according to a protocol approved by the Oklahoma University Health Sciences Center Institutional Review Board and the Institutional Biosafety Committee. These volunteers were healthy nonsmoking subjects, ages 18 to 35 years, with no history of pulmonary or cardiac disease or recent infections. Cells from human subjects were collected in sterile saline solution and centrifuged at 500 × g for 5 min. The supernatant was removed, and the pellets were washed in 10 ml of RPMI 1640 medium containing 50 μg/ml gentamicin and resuspended in 10 ml of RPMI 1640 medium plus 2% FCS supplemented with 50 μg/ml gentamicin (RPMI-2 medium). Cell counts were determined by a hemocytometer. The cell type was determined by morphology using DiffQuik staining (Baxter Healthcare), as well as by flow cytometry using CD16. Cells were resuspended to a concentration of 1 × 106 macrophages/ml. There were >93% human macrophages in each bronchoalveolar lavage cell preparation by morphology and flow cytometry. The 1 ml of cells per well was plated onto 24-well plates and allowed to incubate from 2 to 4 h to facilitate attachment. Subsequently, the medium was removed, and fresh medium containing 2% FCS and 50 μg/ml gentamicin was added. The cells were incubated overnight at 37°C with 5% CO2. Mouse AM were obtained from lavage fluids of mice. C57BL/6 mice were deeply anesthetized and exsanguinated by cutting the distal aorta. The thorax was opened, and a 20-gauge blunt needle was tied into the proximal trachea for lung lavage. Lungs were then flushed with 1 ml of PBS for up to 15 times through the tracheal tube. The aliquots from each animal were pooled for analysis. Lavage fluids were immediately centrifuged for 15 min at 500 × g. Total cells were stained with trypan blue for viability and counted. Differential cell counts were performed on cytospin preparations after staining with DiffQuik. Mouse AM were cultured in RPMI 1640 containing 5% penicillin-streptomycin and 10% FBS. The total of 0.1 × 106 cells were plated per well in an untreated 6-well plate for overnight incubation at 37°C and 5% CO2. Murine BMDM were obtained from femur bone marrow of 4- to 8-wk-old C57BL/6 mice. Cells were collected and resuspended in RPMI 1640 containing 5% penicillin-streptomycin, 10% FBS, and 1/10 volume of CMG14-12 culture supernatant containing M-CSF. Cells were incubated at 37°C and 5% CO2 for up to 7 to 8 days. On day 8, cells were taken off the plate using cell dissociation solution (Sigma-Aldrich) and resuspended in the culture medium. One million cells were plated per well in a 6-well plate overnight at 37°C. For all cell types, culture and cell preparation before flow cytometry were performed in phenol red free medium and solutions. After incubation of the macrophages overnight, the medium was removed, and fresh RPMI-2 medium supplemented with 50 μg/ml gentamicin was added. Macrophages were preincubated with 5 μg/ml LT for human AM and 100 or 500 ng/ml for RAW cells for 1 h before stimulation with B. anthracis Sterne strain 7702 spores at a multiplicity of infection of 1 in triplicate wells of a 24-well plate, and allowed to incubate at 37°C for 7.5 h. Gentamicin remained in the medium during the entire incubation time to ensure that vegetative bacteria would be killed, and that no extracellular toxin would be produced. Absence of biologically active toxins in gentamicin containing culture medium containing spores was confirmed by absence of cleavage of MEK in RAW 264.7 cells (data not shown). Spore diluent and spore diluent plus 5 μg/ml LT for human AM and 100 ng/ml LT for RAW cells were used as negative controls, and LPS (1 μg/ml) and LPS plus 5 μg/ml or 500 ng/ml LT were used as positive controls. For intracellular cytokine measurements, 0.5 ml of 0.05% deoxycholate was added to lyse the cells. The mixture was incubated at 37°C for 10 min, and the supernatant was stored at −20°C. Cytokine ELISA was performed as previously described by using anti-cytokine monoclonal primary capture Abs and biotinylated anti-cytokine polyclonal secondary detection Abs (R&D Systems). Plates were developed using tetramethylbenzidine reagent (BD Biosciences). RAW, murine BMDM, and human AM cells were plated on untreated 6-well plates at a concentration of 1 million cells per well. Mouse AM were plated at a concentration of 0.1 × 106 cells per well. After overnight incubation, all cell types were washed once with PBS and 1 ml of warm, nonenzymatic cell dissociation solution (catalog C5914-100ML; Sigma-Aldrich) was added to each well for 15 min at 37°C. The cells were collected, washed twice with room temperature Stain buffer containing 2% FBS (BD Pharmingen) and adjusted to a concentration of 0.1 × 106 cells per 100 μl of test volume in Stain buffer. Single-use FITC-labeled PA (List Biological Laboratories) was added at concentrations of 1, 10, 100, 500, and 1000 ng/ml. Negative controls were PA diluent and 1000 ng/ml unlabeled PA. The cells were covered, then incubated at room temperature for 60 min, gently rocking. After incubation, cells were pelleted at 300 × g for 5 min, washed once with 4 ml of cold Stain buffer, resuspended in 100 μl of Stain buffer, and put on ice. For RAW, mouse AM, and murine BMDM, 2 μl of anti-mouse F4/80-allophycocyanin conjugate (pan macrophage marker, BM8) or the allophycocyanin rat IgG2a, κ isotype control (eBioscience) was added. Additional Fc receptor blocking was not required. For human AM cells, 1 μl of anti-human CD16-biotin or biotin mouse IgG1, κ isotype control, followed by 0.5 μl of PE-Cy5 streptavidin (BD Pharmingen) were used. All incubations were for 15 min on ice. After cells were washed once and resuspended in 500 μl of Stain buffer, they were read on a BD FACSCalibur flow cytometer with CellQuest Pro software. Ten thousand events were counted. To identify the populations suitable for analysis, murine cells were gated on F4/80-positive events and human AM on CD16+ events, followed in all cases by a scatter gate. For every cell type, ∼86% were members of both gates. Human and mouse AM, murine BMDM, and RAW cells were harvested as described and plated at a density of 1 × 106 cells/ml for human AM, murine BMDM, and RAW cells and of 0.1 × 106 cells/ml for mouse AM. They were maintained overnight at 37°C in 5% CO2 in 2 ml of RPMI-2 medium or DMEM-10 medium and 50 μg/ml gentamicin. Human and mouse AM and murine BMDM were treated with 100, 500, or 5000 ng/ml of LT, and RAW cells were treated with 1, 100, or 500 ng/ml of LT for 3 h. Mock-infected negative control cells were exposed to an equivalent volume of LT-free diluent. After incubation at 37°C in 5% CO2 for the indicated time period, the macrophages were harvested and lysed in 300 μl of cold RIPA lysis buffer (150 mM NaCl, 50 mM Tris (pH 8.0), 10 mM EDTA, 10 mM NaF, 10 mM sodium pyrophosphate, 1% Nonidet P-40, 0.5% sodium deoxycholate, 0.1% SDS, 3 mM sodium vanadate, 10 μg/ml aprotinin, and 10 μg/ml leupeptin). For ATR protein determination, macrophages were directly harvested and lysed in cold RIPA lysis buffer. Macrophage homogenates were clarified by centrifugation at 4°C, and 20–30 μg of the resultant postnuclear lysates were mixed with SDS-PAGE sample buffer (60 mM Tris (pH 6.8), 10% glycerol, 2.3% SDS) and heated to 95°C for 5 min. The samples were separated by 10% SDS-PAGE and electrophoretically transferred onto nitrocellulose membranes. To detect MEK receptor and ATR, the membranes were blocked by 5% powdered milk in Tris-buffered saline and probed overnight with the corresponding Abs (described earlier) in 5% powdered milk in Tris-buffered saline. With the exception of CMG2 \ ANTXR2, where species-specific Abs were used, all MEK and ATR Abs used cross-reacted with both RAW cells and human AM. The membranes were developed with HRP-conjugated specific secondary polyclonal Abs and chemiluminescent reagents (Pierce Biotechnology). The developed membranes were exposed to x-ray film. Human and mouse AM, murine BMDM, or RAW cells were collected into complete medium and plated into untreated 6-well plates at 1.0 × 106/well for RAW cells, human AM, and murine BMDM and at 0.1 × 106/well for mouse AM. Following overnight incubation at 37°C, the medium in each well was aspirated and replaced with 2 ml containing 0, 10, 100, 1000, or 5000 ng/ml LT. The LT concentration consisted of 1:1 addition of single-use PA and LF solutions (List Biological Laboratories), aliquoted at −80°C. For the positive controls, 10 μM/ml staurosporine in DMSO (Life Sciences) was added to human and mouse AM and murine BMDM, whereas 5 μM/ml was added to RAW cells. These amounts were determined from the staurosporine dose curves for human AM and RAW cells (data not shown). After 3 h of treatment at 37°C, medium was removed and saved, and cells were harvested by addition of 1 ml/well of warm trypsin-EDTA solution (Mediatech). None of the cells were scraped from the plastic. Following a PBS wash, cells from each treatment well were washed then resuspended at 1 × 106/ml in cold 1X Annexin buffer, according to the protocol provided in the Vybrant Apoptosis Assay kit (no. 3, catalog no. V13242; Invitrogen). Briefly, 100 μl of cell suspension was added to a Falcon tube, stained at room temperature with 5 μl of Annexin V solution for 15 min (1 μl of Fc receptor blocker optional), washed twice with Annexin buffer, then resuspended in 100 μl of Annexin buffer. Mouse cells were then stained with F4/80-allophycocyanin or isotype, and human AM were stained with biotin CD16/strepavidin PE-Cy5 or isotype for 15 min on ice and covered. Tube volume was brought to 500 μl with Annexin buffer. Samples were run on a BD FACSCalibur flow cytometer using CellQuest Pro software (BD Biosciences). For those samples being tested for necrosis, 2 μl of Vybrant propidium iodide solution was added just before the run. Compensation for spectral overlap in the fluorescence channels were adjusted with samples having cells incubated for 3 h with staurosporine, then stained with either Annexin V, propidium iodide, F4/80-allophycocyanin or biotin CD16/strepavidin PE-Cy5. RAW cells were also processed using the Vybrant FAM Poly Caspases Assay kit as a countertest. Total RNA from RAW and human AM cells was extracted using a modified TRIzol (Invitrogen) protocol, spectrophometrically quantitated, and the integrity verified by formaldehyde agarose gel electrophoresis. Equal amounts (2 μg) of RNA from both cell types were used with oligo(dT) as primers for production of cDNA (SuperScript First Strand Synthesis System for RT-PCR; Invitrogen) to produce cDNA. Gene-specific primers for the receptors and the GAPDH housekeeping genes were used in standard PCR on a MJ Research DNA Engine thermal cycler with the following program: 1 cycle of 94°C for 2 min, 48°C for 1 min, 72°C for 1 min, followed by 32 cycles of 94°C for 30 s, 48°C for 30 s, 72°C for 1 min, and ending with a 72°C for 7 min extension. Preliminary experiments showed the exponential amplification phase of all the amplicons to be between 24 and 31 cycles. The primer sequences were as follows: TEM8 \ ANTXR1 (forward) 5′-TGCTGCACCACTGGAATGAAATC-3′, (reverse) 5′-CTCCTCCTGGCAGAACTTTCTGG-3′; CMG2 \ ANTXR2 (forward) 5′-CTTTCATTGTGTTTTCTTCTCAAGCAAC-3′, (reverse) 5′-TGCATAAGATGGTACCAGGC-3′; mouse GAPDH (forward) 5′-AACTTTGGCATTGTGGAAGG-3′, (reverse) 5′-ACACATTGGGGGTAGGAACA-3′; and human GAPDH (forward) 5′-GGAAGGTGAAGGTCGGAGT-3′, (reverse) 5′-GAAGATGGTGATGGGATTTC-3′ (20). Following PCR, samples were separated on a 1.5% agarose gel, then stained with ethidium bromide (Invitrogen) for imaging and the band volumes calculated by ImageQuant 5.0 software (Molecular Dynamics). ATR band density from RAW cells and human AM were normalized to the corresponding GAPDH density to correct for potential differences in input cDNA. The current assumption that human AM are susceptible to innate immune suppression by LT is partially based on work using mouse RAW 264.7 macrophages and human AM independently (18). Our first objective was thus to determine the relative sensitivity of these cells by direct comparisons of the effects of LT on RAW 264.7 mouse macrophage cells and human AM. Human AM and RAW cells were exposed to various doses of LT (LF+EF) for 1 h before stimulation with B. anthracis spores (multiplicity of infection of 1) and incubated for 7.5 h. Spore diluent (mock) and LT (mock+LT) was used as negative controls, and LPS (1 μg/ml) and LPS plus LT were used as positive controls. The effects of these stimuli and inhibitors on RAW cells and human AM cytokine release were measured by ELISA of the cell supernatants. Spores induced an innate immune cytokine response in both murine RAW cells and human AM. Specifically, spores increased TNF-α and MCP-1 release by 35- and 9-fold, respectively, in RAW cells, and 19- and 3-fold, respectively, in human AM. Cytokine induction was greatly reduced by LT treatment in RAW cells, as 100 ng/ml LT decreased the induction of TNF-α 16-fold, and induction of MCP-1 by 6-fold (Fig. 1⇓A). We did not test LT doses above 100 ng/ml because doses of LT greater than this completely lysed RAW 264.7 cells. This sensitivity of RAW to LT immunosuppressive effects is consistent with effects seen in a previous study (21). In contrast, human AM were resistant to the immunosuppressive effects of LT. Addition of 5000 ng/ml LT (50 times the RAW dose, enough to cause complete lysis of these cells) for the same time period only decreased the TNF-α and MCP-1 response to spores by 9- and 2-fold, respectively, and had a much smaller effect on the TNF response to LPS (Fig. 1⇓B). 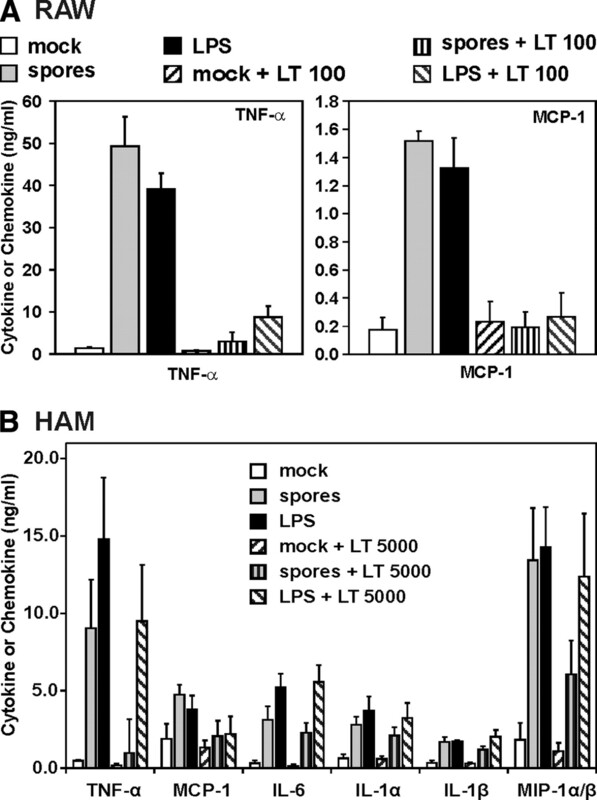 Human AM were also resistant to the immunosuppressive effects of LT (5000 ng/ml) on spore-induced induction of IL-1α, IL-1β, IL-6, and MIP-1α/β (Fig. 1⇓B). These results demonstrate that, compared with RAW cells, human AM are very resistant to innate immune suppression by B. anthracis toxins, as measured by induction of cytokine release by B. anthracis spores. Human AM are resistant to LT-mediated innate immune cytokine suppression. RAW cells (A) and human AM (HAM; B) were exposed to 100 and 5000 ng/ml LT, respectively, for 1 h before stimulation with B. anthracis spores at a multiplicity of infection of 1, and incubated at 37°C for 7.5 h. Spore diluent and spore diluent plus LT were used as negative controls, and LPS (1 μg/ml) and LPS plus LT were used as positive controls. Cytokine or chemokine proteins were measured in media supernatants by ELISA, or in cellular extracts in the case of IL-1α and IL-1β. Results are shown as mean ± SEM from three separate experiments. We have previously demonstrated that MAPK activation is required for innate immune cytokine induction by B. anthracis spores in human AM. Activation of MAPK requires phosphorylation of the MAPK protein on both tyrosine and threonine (22, 23), a reaction catalyzed by the protein kinase referred to as MAPK kinase or MEK. Previous work by other groups has shown that B. anthracis LF inhibits MAPK signaling in activated murine macrophages by cleaving the N-terminal extension of MEK that activates MAPK (17, 24, 25). We compared the relative sensitivity of RAW 264.7 cells, murine BMDM, and mouse and human AM with LT-mediated MEK cleavage. All cells were exposed to increasing doses of LT (PA+LF) for 3 h, cell lysates harvested, and MEK cleavage analyzed using anti-MEK Abs specific for intact (noncleaved) MEK. The results show that in RAW cells, MEK-1, MEK-2, MEK-6, and MEK-7 are cleaved by doses of LT at or above 100 ng/ml (Fig. 2⇓). In contrast, even at doses that completely lyse RAW cells (5000 ng/ml), only MEK-1 is significantly cleaved in human AM (Fig. 2⇓). Generally, murine BMDM and mouse AM have similar sensitivity to LT mediated-MEK cleavage as RAW 264.7 cells. In these cells, MEK-1 and MEK-2 are cleaved by 100 ng/ml LT, the same dose as in RAW 264.7 cells. In murine BMDM, MEK-6 is more resistant to LT cleavage than in RAW cells, but more susceptible than in human AM. MEK-7 in mouse AM is not cleaved by LT of 5000 ng/ml, as in human AM. The results confirm that human AM are resistant to B. anthracis virulence toxins. MEK in murine BMDM and mouse AM are cleaved by LT as they are in RAW cells, but in some cases higher LT doses are required. In terms of the relative resistance of human AM to LT, this observation is consistent with the resistance of these cells to suppression of innate immune cytokine responses by LT.
Human AM are more resistant than mouse AM, murine BMDM, and RAW 246.7 cells to MEK cleavage by LT. Human AM (HAM), mouse AM (MAM), murine BMDM, and RAW 264.7 cells were treated with LT-free diluent or LT at the indicated concentrations for 3 h at 37°C. The cells were harvested in RIPA buffer, the lysate proteins were resolved by SDS-PAGE, the gels were blotted to polyvinylidene difluoride membranes, and the membranes were then probed with the anti-MEK Abs, as shown. Data are representative of four separate experiments. MEK cleavage by LT in macrophages has been linked to induction of apoptosis in these cells (17). This finding is consistent with the current paradigm, which holds that HAM are sensitive to immunosuppressive effects of LT (18, 26, 27). We measured the relative sensitivity of RAW macrophages, murine BMDM, and mouse and human AM cells to LT-mediated apoptosis using flow cytometry. Human AM and RAW cells were incubated for 3 h with increasing doses of LT. Staurosporine (5–10 μM) was used as a positive control for apoptosis for all cell types. Cells exposed to spore and staurosporine diluent were used as negative controls. Apoptosis and necrosis were measured by staining with Annexin V (apoptosis) and propidium iodide (necrosis). The results shown in Fig. 3⇓ (and see supplemental Fig. S1)4 confirmed that RAW cells are very sensitive to LT-mediated apoptosis, as 10 and 100 ng/ml LT-induced apoptosis in 86% and 94% of the RAW cells, respectively. Approximately one-third (LT10) or one-half (LT100) of the apoptotic cells were also necrotic (Fig. 3⇓A). A total of 5% of the total cell population had progressed to necrosis, without detectable apoptosis. Doses of LT greater than 100 ng/ml completely lysed RAW cells and there were not enough events from intact cells to count. In contrast, at all doses of LT up to and including 5000 ng/ml LT, only 25% of the human AM were apoptotic and of that amount, only 10% had also become necrotic (Fig. 3⇓D). Some 3% or less of the human AM had progressed to necrosis without detectable apoptosis. There was also no dose response to LT in human AM. For mouse AM, 100 ng/ml LT only caused 11% of the cells to apoptose, with one-third of these also being necrotic (Fig. 3⇓C); the same dose caused 94% apoptosis for RAW cells. Murine BMDM were initially not as healthy as the other cell types as ∼54% of untreated (mock) cells were apoptotic. However, LT, even at 500 ng/ml, failed to further enhance apoptosis (Fig. 3⇓B). Thus, MAM and murine BMDM were also resistant to LT-mediated apoptosis, similarly to HAM. Human and mouse AM and murine BMDM are resistant to LT-mediated apoptosis, and RAW 246.7 cells are sensitive. Human and mouse AM, murine BMDM, and RAW cells were exposed to the LT at the specified doses for 3 h then stained for apoptosis and necrosis. Samples were analyzed using a BD FACSCalibur flow cytometer using CellQuest Pro software. Annexin V was used as the apoptosis marker, and propidium iodide was used as the necrosis marker. A, Necrosis alone, apoptosis alone, and apoptosis and necrosis induced by 10–100 ng/ml LT in RAW cells is shown. B–D, Necrosis alone, apoptosis alone, and apoptosis and necrosis induced by 10–5000 ng/ml of LT in murine BMDM, human AM (HAM), and mouse AM (MAM) is shown. Doses of LT greater than 100 ng/ml completely lysed RAW cells (data not shown). Compensation was set with staurosporine-treated cells. Results are shown as mean ± SEM from three separate experiments. These results show that AM are resistant to LT-mediated apoptosis. Resistance of human AM to MEK cleavage may play a part in resistance of these cells to LT-mediated apoptosis. This cannot completely account for this phenomenon, as mouse AM and murine BMDM are also resistant to LT-induced apoptosis, despite the fact the LT causes MEK cleavage in these cells. We next sought to determine whether there could be any relationship between LT-mediated MEK cleavage and induction of apoptosis, and binding of the B. anthracis toxin component PA to our cells. PA is the cellular binding component of the A/B B. anthracis toxins LT and ET. We measured binding of PA to RAW cells, murine BMDM, and mouse and human AM by flow cytometry using FITC-conjugated PA. All the cells were either exposed to various concentrations of FITC-PA or unlabeled PA, or the cells were exposed to PA diluent (negative control). The results show that there was minimal background fluorescence in the presence of PA diluent or 1000 ng/ml unlabeled PA in all of the cells tested (Fig. 4⇓ and see supplemental Fig. S2).4 There was significant binding of FITC-PA to RAW, murine BMDM, and mouse AM cells that increased with increasing doses of PA, at all doses tested up to 1000 ng/ml PA (Fig. 4⇓). In contrast, there was no significant binding of PA to human AM, even when 1000 ng/ml FITC-PA was used (Fig. 4⇓). These results show that human AM do not bind significant amounts of PA. The results also show that there is binding of PA to the other three cell types. These three cell types were also relatively sensitive to LT-mediated MEK cleavage. This suggests a mechanism for the resistance of human AM to LT-mediated MEK cleavage due to a lack of binding sites for the binding partner of LT, PA. The amount of PA binding did not directly correlate with sensitivity of the cell types to LT-mediated apoptosis. RAW cells, murine BMDM, and mouse AM but not human AM bind PA. One million cells per ml phenol red free RPMI 1640 plus 2% FCS were exposed to FITC-PA at 10, 100, 500, and 1000 ng/ml. Mock treated cells and cells exposed to unlabeled PA at 1000 ng/ml served as negative controls. Following incubations at room temperature for 60 min, the RAW cells, mouse AM (MAM), human AM (HAM), and murine BMDM were washed, fixed in 4% paraformaldehyde, and cell-associated FITC-PA was determined with a BD FACScan. The gates were adjusted to include no more than 1% of the control cells. Data are representative of four separate experiments. CMG2 \ ANTXR2 and TEM8 \ ANTXR1 have been identified as the ATR. Previous reports have suggested that ATR is expressed in human AM, but this has only been tested at the level of mRNA expression. We next sought to confirm whether ATR was expressed in human AM both at the mRNA level and protein level, as decreased ATR expression could contribute to the relative resistance of these cells to the immunosuppressive effects of LT, as well as the lack of binding of PA to the cells. Endogenous mRNA levels of TEM8 \ ANTXR1 and CMG2 \ ANTXR2 were determined using relative end point RT-PCR in human AM and RAW cells. RNA expression of both receptors was detected in both cell types. TEM8 \ ANTXR1 expression levels were similar in RAW and human AM cells at 9 and 8% of GAPDH levels, respectively (Fig. 5⇓). CMG2 \ ANTXR2 expression was greater in RAW cells than human AM cells at 21 and 13% of GAPDH levels, respectively (Fig. 5⇓). RAW cells express more CMG2 \ ANTXR2 mRNA than human AM. Total RNA was isolated from RAW cells and human AM. Relative end point RT-PCR was performed using oligo(dT) as the primer for the first strand synthesis. Primers specific for TEM8 \ ANTXR1, CMG2 \ ANTXR2, and GAPDH were used to amplify the resultant cDNA. A, Reaction products were then separated by agarose gel electrophoresis, and mRNA expression from RAW and human AM (HAM) was determined by densitometry of ethidium bromide stained gels. 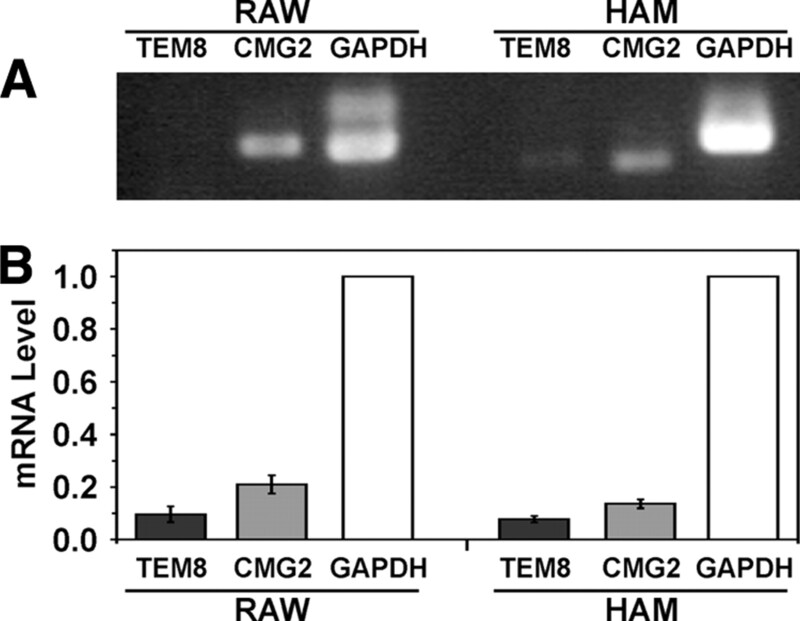 B, Transcript levels of RAW and human AM (HAM) TEM8 \ ANTXR1 and CMG2 \ ANTXR2 were normalized relative to the constitutively expressed human and mouse GAPDH genes. Results shown are mean ± SEM from three separate experiments. We then attempted to measure expression of TEM8 \ ANTXR1 and CMG2 \ ANTXR2 receptor proteins in human and mouse AM, murine BMDM, and RAW cells by immunoblotting of cell extracts using anti-TEM8 \ ANTXR1 and anti-CMG2 \ ANTXR2 Abs. Peptide and fusion protein standards were used to quantify the amounts of TEM8 \ ANTXR1 and CMG2 \ ANTXR2. Ab to the αM component of the Mac-1 (CD11b) receptor was used as a control for detection of cellular receptor expression in the four cell types studied, and GAPDH was used as a loading standard. The results (Fig. 6⇓) show that there was minimal expression (<50 ng/mg lysate protein) of TEM8 \ ANTXR1 in all of the cell types tested. For CMG2 \ ANTXR2 in human AM, we did not detect expression, though whole human lung tissue extracts, which would include capillaries, contained this protein (data not shown). We were unable to confidently assess the level of CMG2 protein expression in any mouse tissue or cell type using the commercially available Abs. Human AM express minimal amounts of the ATR TEM8 \ ANTXR1. Untreated human AM (HAM), mouse AM (MAM), murine BMDM, and RAW cells were harvested in RIPA lysis buffer. The lysates were resolved by SDS-PAGE, and the gels were blotted to polyvinylidene difluoride membranes. Dilutions of recombinant proteins were used for quantification. Membranes were then probed with anti-TEM8 \ ANTXR1 (A), anti-MAC-1a (CD11b; B) Abs, or anti-GAPDH (C). 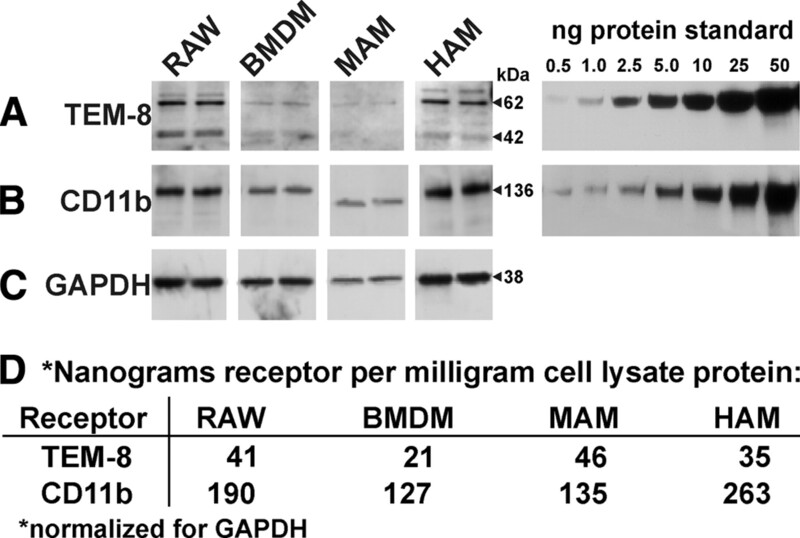 D, Expression of receptors per milligram of cell lysate protein was determined by densitometry using the dilutions of recombinant receptor proteins. These results demonstrate that, in contrast to the mRNA levels detected by our laboratory and others, there is minimal expression of TEM8 \ ANTXR1, and no expression of CMG2 \ ANTXR2 in human AM cells. These results are consistent with our finding that there is minimal binding of PA to human AM. Also, the findings support a mechanism whereby a lack of expression of LT receptors in human AM may contribute to the resistance of these cells to the immunosuppressive effects of this virulence factor. The differences in binding of PA between human AM and the murine cell types may be due to differential protein expression of CMG2 \ ANTXR2 in these cells, although we were unable to assess this. Anthrax toxins are thought to play a role in the pathogenesis of inhalational anthrax, but the exact role and cellular target of these toxins is unclear. It has been postulated that the target of the toxins is the AM and that innate immune suppression by toxins is the mechanism of virulence. In a sense, this hypothesis is logical because the innate immune response likely assists with early containment of the pathogen, as there is a significant delay between exposure to the pathogen and disease. Also, the AM is the main phagocytic cell of the lung and human and macaque AM as well as murine BMDM rapidly internalize the pathogen and kill spores after internalization (19, 28, 29). Furthermore, expression of the known receptors for LT, TEM8 \ ANTXR1 and CMG2 \ ANTXR2, was identified at the transcriptional level in cells from human bronchoalveolar lavage fluid, which contains primarily macrophages (18, 30, 31). Additional support for the hypothesis that the AM is the cellular target of LT has been adduced from studies using other macrophage types. For example, LT induces apoptosis and necrosis in mouse macrophage cell lines and BMDM (17, 27). LT has also been shown to induce apoptosis in activated human peripheral blood monocytes (32). LT also has other immunosuppressive effects. High doses of LT blunts (1 μg/ml) LPS-mediated induction of TNF-α, IL-1β, IL-6, and IL-8 by LPS in nonhuman primate AM (28). However, sensitivity of AM to B. anthracis toxins would not explain the finding in animal models, and in human autopsy studies, that the alveolar space in alveoli that are not flooded are cleared of the pathogen (5, 6, 7). In humans, even in end-stage disease, the gradient of bacterial concentration is from the vascular space to the alveolar spaces (6). This suggests that the alveolar space is so hostile to B. anthracis, perhaps because the AM efficiently kills the pathogen (28, 29), that it can only be infected in a retrograde fashion, from the vascular space, during the terminal phase of disease when high-grade bacteremia is present. One explanation for these findings would be, in contrast to the current paradigm, that AM are, in fact, relatively resistant to the effects of B. anthracis toxins and can thus clear the pathogen from the alveolar space. Our findings show that this is indeed the case. 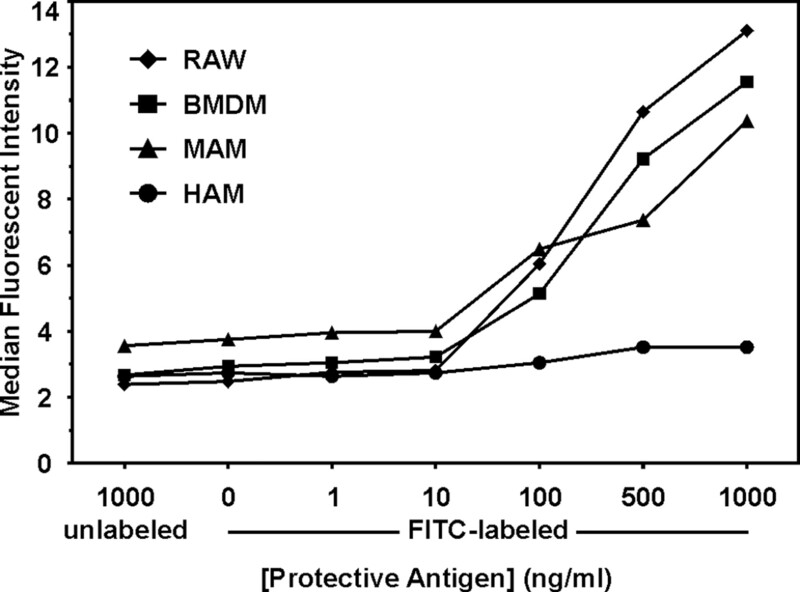 By comparison to a commonly used surrogate for ex vivo murine macrophages, the RAW macrophage cell line, mouse and human AM, as well as murine BMDM are resistant to some, or all, of the effects of B. anthracis LT. Of these cells human AM showed considerable resistant to all of the effects of LT, including inhibition of spore-mediated cytokine induction, LT-mediated MEK cleavage, and LT-mediated apoptosis. Mouse AM and murine BMDM, although showing intermediate sensitivity to LT-mediated MEK cleavage, showed comparable resistance to LT-mediated apoptosis as did human AM. Our findings demonstrate that the mechanism of human AM resistance relative to that of RAW cells is likely at least partly due to the relative lack of expression of functional ATR in these cells. There was no significant binding of PA to human AM. Although there was minimal expression of TEM8 \ ANTXR1 on both cell types, there was no significant expression of CMG2 \ ANTXR2 on human AM. We were unable to assess CMG2 \ ANTXR2 protein expression in RAW cells. However, there was clearly a difference in functional PA binding between RAW and human AM cells. This difference is functionally significant, as downstream effects of the toxin, namely cytokine inhibition, MEK cleavage, and induction of apoptosis, were dramatically decreased in human AM as compared with RAW cells. We do not think the difference in our assessment of the level of expression of PA binding sites in human AM is due to differences in our handling or processing of the cells used because we demonstrate similar expression of the known ATR at the level of transcription as other groups (18). Furthermore, it has been demonstrated that MEK-3 is not cleaved during infection of human AM by B. anthracis, which is consistent with a lack of functional ATR in these cells (33). Thus, it is more likely that the ATR mRNA is either not translated or that the expressed protein is rapidly degraded, and thus not detected in human AM. It should be noted, however, that differential expression of functional PA binding sites, and even differences in susceptibility to LT-mediated MEK cleavage, do not fully account for the differences in the biological effects of LT in the various cells we tested. PA binding, and MEK cleavage was similar in RAW, murine BMDM, and mouse AM cells. However, murine BMDM and mouse AM were relatively resistant to LT-mediated induction of apoptosis, whereas RAW cells were sensitive to this effect. This along with the findings of others, suggests that MEK cleavage is necessary and sufficient for induction of apoptosis in immature macrophages (17), but MEK cleavage is not sufficient for apoptosis in mature AM (28). We suspect that this is due to the anti-apoptotic machinery of the mature cell types (34, 35, 36). Our results comparing the sensitivity of these cell types to LT may have other implications. Recently overexpression of secretory phospholipase A2 has been shown to protect against B. anthracis infection in a mouse model (37). We demonstrate that RAW 264.7 cells, which are derived from secretory phospholipase A2-expressing BALB/c mouse strain, are more sensitive to LT than mouse AM from C57BL/6 mice, which do not express secretory phospholipase A2. This suggests the mechanism of secretory phospholipase A2 activity against B. anthracis does not include enhancing macrophage resistance to LT. The first conclusion that can be drawn from our findings is that the mature, resident AM is not a significant target of the anthrax LT in mice and humans. Although our study did not measure sensitivity of mouse or human AM to ET, the lack of functional PA binding in human AM makes it unlikely that these cells are a target for ET either, though sensitivity at high doses has been shown in macrophages from other species, namely guinea pigs (38). However, the fact remains that toxins are important in the pathogenesis of the disease as development of Abs to PA after vaccination is predictive of protection (16, 39), and externally introduced PA Abs are protective in rabbit models (15). Another possibility is that B. anthracis toxins are not important in the early phase of inhalational anthrax, but that is unlikely as Abs to PA delay dissemination of the pathogen (15). More likely, the target of the toxin is another cell type in the lung, and we are investigating that possibility. That cell type will, of course, express a significant amount of the ATR. Our findings also suggest that the AM is an unlikely candidate for the role of carrier of the pathogen to the thoracic lymph nodes. That is if, as we suggest, the AM is effective at clearing the pathogen from the alveolar space due to toxin resistance, then spore-bearing macrophages would still be able to dispose of the pathogen, whereas they are in transit to the thoracic lymph nodes. Our results thus are consistent with the work of Cleret et al. (5) who demonstrated in a mouse model that DC are likely the major transporter of B. anthracis spores to the thoracic lymph nodes, and the work of Brittingham et al. (40) who demonstrated that B. anthracis may exploit human DC to facilitate infection. Mouse DC have also been shown to be vulnerable to B. anthracis LT (41, 42). Sensitivity of DC to LT may protect the pathogen from destruction during transit to the regional lymph nodes. How then, does the pathogen overcome the sentinel cell of the lung, the AM? We suspect that the pathogen does not so much as overcome the AM as much as it escapes it by bypassing this cell, by weight of numbers. Although the exact number of spores required to cause an infection in humans is unknown, it is estimated that occupational exposure in goat hair mills is ∼510 particles per 8-h shift, and yet disease was uncommon in this population, even before vaccination was required (43, 44). If it is assumed that anthrax victims of the 2001 postal bioterrorism incident were infected by a low number of spores, this might seem inconsistent with our conclusions. However, because the envelopes contained over 100 billion spores per gram of powder, a very small amount of powder could have delivered a huge dose of spores (45). Taken together, the results in our study demonstrate that human AM are resistant to innate immune suppression by B. anthracis toxins, and may explain why B. anthracis is cleared from the alveolar space in human autopsy specimens. Resistance of the AM to the B. anthracis toxins may also determine the minimal infectious dose of spores that is required to cause disease in humans. We acknowledge the kind assistance of the nursing and bronchoscopy staff of the Veterans Affairs Hospital of Oklahoma City. We also acknowledge the assistance and expertise of the Oklahoma Medical Research Foundation Flow Cytometry core facility. ↵1 This work was partially supported by the National Institute of Allergy and Infectious Diseases Project 1U19 AI62629 (to J.P.M., J.D.B., and K.M.C. ), and by a Clinical Innovator Award from the Flight Attendant Medical Research Institute (to W.W.). ↵3 Abbreviations used in this paper: AM, alveolar macrophage; LT, lethal toxin; ET, edema toxin; DC, dendritic cell; LF, lethal factor; EF, edema factor; ATR, anthrax toxin receptor; BMDM, bone marrow-derived macrophage; PA, protective Ag. Dixon, T. C., M. Meselson, J. Guillemin, P. C. Hanna. 1999. Anthrax. N. Engl. J. Med. 341: 815-826. Meselson, M., J. Guillemin, M. Hugh-Jones, A. Langmuir, I. Popova, A. Shelokov, O. Yampolskaya. 1994. The Sverdlovsk anthrax outbreak of 1979. Science 266: 1202-1208. Druett, H. A., D. W. Henderson, L. Packman, S. Peacock. 1953. Studies on respiratory infection. I. The influence of particle size on respiratory infection with anthrax spores. J. Hyg. 51: 359-371. Albrink, W. S., R. J. Goodlow. 1959. Experimental inhalation anthrax in the chimpanzee. Am. J. Pathol. 35: 1055-1065. Cleret, A., A. Quesnel-Hellmann, A. Vallon-Eberhard, B. Verrier, S. Jung, D. Vidal, J. Mathieu, J. N. Tournier. 2007. Lung dendritic cells rapidly mediate anthrax spore entry through the pulmonary route. J. Immunol. 178: 7994-8001. Grinberg, L. M., F. A. Abramova, O. V. Yampolskaya, D. H. Walker, J. H. Smith. 2001. Quantitative pathology of inhalational anthrax I: quantitative microscopic findings. Mod. Pathol. 14: 482-495. Cote, C. K., N. Van Rooijen, S. L. Welkos. 2006. Roles of macrophages and neutrophils in the early host response to Bacillus anthracis spores in a mouse model of infection. Infect. Immun. 74: 469-480. Guidi-Rontani, C.. 2002. The alveolar macrophage: the Trojan horse of Bacillus anthracis. Trends Microbiol. 10: 405-409. Ross, J. M.. 1957. The pathogenesis of anthrax following the administration of spores by the respiratory route. J. Pathol. Bacteriol. 73: 485-494. Welkos, S. L., T. J. Keener, P. H. Gibbs. 1986. Differences in susceptibility of inbred mice to Bacillus anthracis. Infect. Immun. 51: 795-800. Prince, A. S.. 2003. The host response to anthrax lethal toxin: unexpected observations. J. Clin. Invest. 112: 656-658. Hanna, P. C., D. Acosta, R. J. Collier. 1993. On the role of macrophages in anthrax. Proc. Natl. Acad. Sci. USA 90: 10198-10201. Heninger, S., M. Drysdale, J. Lovchik, J. Hutt, M. F. Lipscomb, T. M. Koehler, C. R. Lyons. 2006. Toxin-deficient mutants of Bacillus anthracis are lethal in a murine model for pulmonary anthrax. Infect. Immun. 74: 6067-6074. Auerbach, S., G. G. Wright. 1955. Studies on immunity in anthrax. VI. Immunizing activity of protective antigen against various strains of Bacillus anthracis. J. Immunol. 75: 129-133. Peterson, J. W., J. E. Comer, W. B. Baze, D. M. Noffsinger, A. Wenglikowski, K. G. Walberg, J. Hardcastle, J. Pawlik, K. Bush, J. Taormina, et al 2007. Human monoclonal antibody AVP-21D9 to protective antigen reduces dissemination of the Bacillus anthracis Ames strain from the lungs in a rabbit model. Infect. Immun. 75: 3414-3424. Weiss, S., D. Kobiler, H. Levy, H. Marcus, A. Pass, N. Rothschild, Z. Altboum. 2006. Immunological correlates for protection against intranasal challenge of Bacillus anthracis spores conferred by a protective antigen-based vaccine in rabbits. Infect. Immun. 74: 394-398. Park, J. M., F. R. Greten, Z. W. Li, M. Karin. 2002. Macrophage apoptosis by anthrax lethal factor through p38 MAP kinase inhibition. Science 297: 2048-2051. Banks, D. J., M. Barnajian, F. J. Maldonado-Arocho, A. M. Sanchez, K. A. Bradley. 2005. Anthrax toxin receptor 2 mediates Bacillus anthracis killing of macrophages following spore challenge. Cell Microbiol. 7: 1173-1185. Chakrabarty, K., W. Wu, J. L. Booth, E. S. Duggan, K. M. Coggeshall, J. P. Metcalf. 2006. Bacillus anthracis spores stimulate cytokine and chemokine innate immune responses in human alveolar macrophages through multiple mitogen-activated protein kinase pathways. Infect. Immun. 74: 4430-4438. Premanandan, C., M. D. Lairmore, S. Fernandez, A. J. Phipps. 2006. Quantitative measurement of anthrax toxin receptor messenger RNA in primary mononuclear phagocytes. Microb. Pathog. 41: 193-198. Erwin, J. L., L. M. DaSilva, S. Bavari, S. F. Little, A. M. Friedlander, T. C. Chanh. 2001. Macrophage-derived cell lines do not express proinflammatory cytokines after exposure to Bacillus anthracis lethal toxin. Infect. Immun. 69: 1175-1177. Seger, R., N. G. Ahn, T. G. Boulton, G. D. Yancopoulos, N. Panayotatos, E. Radziejewska, L. Ericsson, R. L. Bratlien, M. H. Cobb, E. G. Krebs. 1991. Microtubule-associated protein 2 kinases, ERK1 and ERK2, undergo autophosphorylation on both tyrosine and threonine residues: implications for their mechanism of activation. Proc. Natl. Acad. Sci. USA 88: 6142-6146. Wu, J., A. J. Rossomando, J. H. Her, R. Del Vecchio, M. J. Weber, T. W. Sturgill. 1991. Autophosphorylation in vitro of recombinant 42-kilodalton mitogen-activated protein kinase on tyrosine. Proc. Natl. Acad. Sci. USA 88: 9508-9512. Duesbery, N. S., G. F. Vande Woude. 1999. Anthrax lethal factor causes proteolytic inactivation of mitogen-activated protein kinase kinase. J. Appl. Microbiol. 87: 289-293. Duesbery, N. S., C. P. Webb, S. H. Leppla, V. M. Gordon, K. R. Klimpel, T. D. Copeland, N. G. Ahn, M. K. Oskarsson, K. Fukasawa, K. D. Paull, G. F. Vande Woude. 1998. Proteolytic inactivation of MAP-kinase-kinase by anthrax lethal factor. Science 280: 734-737. Popov, S. G., R. Villasmil, J. Bernardi, E. Grene, J. Cardwell, A. Wu, D. Alibek, C. Bailey, K. Alibek. 2002. Lethal toxin of Bacillus anthracis causes apoptosis of macrophages. Biochem. Biophys. Res. Commun. 293: 349-355. Lin, C. G., Y. T. Kao, W. T. Liu, H. H. Huang, K. C. Chen, T. M. Wang, H. C. Lin. 1996. Cytotoxic effects of anthrax lethal toxin on macrophage-like cell line J774A.1. Curr. Microbiol. 33: 224-227. Ribot, W. J., R. G. Panchal, K. C. Brittingham, G. Ruthel, T. A. Kenny, D. Lane, B. Curry, T. A. Hoover, A. M. Friedlander, S. Bavari. 2006. Anthrax lethal toxin impairs innate immune functions of alveolar macrophages and facilitates Bacillus anthracis survival. Infect. Immun. 74: 5029-5034. Hu, H., Q. Sa, T. M. Koehler, A. I. Aronson, D. Zhou. 2006. Inactivation of Bacillus anthracis spores in murine primary macrophages. Cell Microbiol. 8: 1634-1642. Liu, S., S. H. Leppla. 2003. Cell surface tumor endothelium marker 8 cytoplasmic tail-independent anthrax toxin binding, proteolytic processing, oligomer formation, and internalization. J. Biol. Chem. 278: 5227-5234. Scobie, H. M., G. J. Rainey, K. A. Bradley, J. A. Young. 2003. Human capillary morphogenesis protein 2 functions as an anthrax toxin receptor. Proc. Natl. Acad. Sci. USA 100: 5170-5174. Popov, S. G., R. Villasmil, J. Bernardi, E. Grene, J. Cardwell, T. Popova, A. Wu, D. Alibek, C. Bailey, K. Alibek. 2002. Effect of Bacillus anthracis lethal toxin on human peripheral blood mononuclear cells. FEBS Lett. 527: 211-215. Gold, J. A., Y. Hoshino, S. Hoshino, M. B. Jones, A. Nolan, M. D. Weiden. 2004. Exogenous γ and α/β interferon rescues human macrophages from cell death induced by Bacillus anthracis. Infect. Immun. 72: 1291-1297. Komuro, I., T. Yasuda, A. Iwamoto, K. S. Akagawa. 2005. Catalase plays a critical role in the CSF-independent survival of human macrophages via regulation of the expression of BCL-2 family. J. Biol. Chem. 280: 41137-41145. Liao, H. S., A. Matsumoto, H. Itakura, T. Pittman, T. Kodama, Y. J. Geng. 1999. De novo expression of the class-A macrophage scavenger receptor conferring resistance to apoptosis in differentiated human THP-1 monocytic cells. Cell Death Differ. 6: 245-255. Blanc-Brude, O. P., E. Teissier, Y. Castier, G. Leseche, A. P. Bijnens, M. Daemen, B. Staels, Z. Mallat, A. Tedgui. 2007. IAP survivin regulates atherosclerotic macrophage survival. Arterioscler. Thromb. Vasc. Biol. 27: 901-907. Piris-Gimenez, A., M. Paya, G. Lambeau, M. Chignard, M. Mock, L. Touqui, P. L. Goossens. 2005. In vivo protective role of human group IIa phospholipase A2 against experimental anthrax. J. Immunol. 175: 6786-6791. Williamson, E. D., I. Hodgson, N. J. Walker, A. W. Topping, M. G. Duchars, J. M. Mott, J. Estep, C. Lebutt, H. C. Flick-Smith, H. E. Jones, H. Li, C. P. Quinn. 2005. Immunogenicity of recombinant protective antigen and efficacy against aerosol challenge with anthrax. Infect. Immun. 73: 5978-5987. Brittingham, K. C., G. Ruthel, R. G. Panchal, C. L. Fuller, W. J. Ribot, T. A. Hoover, H. A. Young, A. O. Anderson, S. Bavari. 2005. Dendritic cells endocytose Bacillus anthracis spores: implications for anthrax pathogenesis. J. Immunol. 174: 5545-5552. Agrawal, A., J. Lingappa, S. H. Leppla, S. Agrawal, A. Jabbar, C. Quinn, B. Pulendran. 2003. Impairment of dendritic cells and adaptive immunity by anthrax lethal toxin. Nature 424: 329-334. Cleret, A., A. Quesnel-Hellmann, J. Mathieu, D. Vidal, J. N. Tournier. 2006. Resident CD11c+ lung cells are impaired by anthrax toxins after spore infection. J. Infect. Dis. 194: 86-94. Dahlgren, C. M., L. M. Buchanan, H. M. Decker, S. W. Freed, C. R. Phillips, P. S. Brachman. 1960. Bacillus anthracis aerosols in goat hair processing mills. Am. J. Hyg. 72: 24-31. Brachman, P. S.. 1980. Inhalation anthrax. Ann. NY Acad. Sci. 353: 83-93. Inglesby, T. V., T. O'Toole, D. A. Henderson, J. G. Bartlett, M. S. Ascher, E. Eitzen, A. M. Friedlander, J. Gerberding, J. Hauer, J. Hughes, et al 2002. Anthrax as a biological weapon, 2002: updated recommendations for management. J. Am. Med. Assoc. 287: 2236-2252.